The Executive Committee is the leadership of DA Switzerland, made up of eleven members like you who volunteer their time and skills to represent and organize Democrats across Switzerland. Nine are elected and two sit ex-officio. Per our by-laws, we’ve appointed a Nominations Committee to run this election process and seek out candidates to stand for office. We seek members excited to be part of the 2016 U.S. Presidential Elections, and help Democrats win races at all levels of our political process. In Spring 2016 we will hold Democrats Abroad’s Global Primary, where our members can vote for their preferred Democratic presidential candidate. There will be fundraisers, Get-Out-The-Vote campaigns around Switzerland, debate watches, and more! Now is the time to heed the call for candidates, and get involved. Terms are for two years, from March 2015 until March 2017. 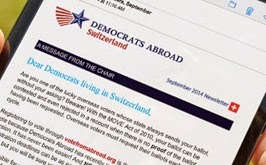 The growth and sustainability of Democrats Abroad Switzerland are a top priority. Joining the leadership of Democrats Abroad is a great opportunity to build up experience, broaden your network, have fun and meet great people. And mainly, you get to play a critical role in helping ELECT DEMOCRATS!! Please Consider Running for an Office! All registered members living in Switzerland are eligible (and encouraged!) to run for one of these these positions and to vote at the Annual Meeting. ✔︎ Saturday, March 14 – Elections will be held during the Annual General Meeting. Save the date! Represent DACH at meetings of the DPCA (Dems Abroad International) in accordance with the DPCA Charter, and report to the DACH ExCom on DPCA activities, issues, votes, etc. DACH Member-At-Large Positions (4) Pursuant to our bylaws updated March 2014, the DACH ExCom now includes 4 Member-At-Large positions. The ExCom has decided to designate specific duties to 3 of those 4. Candidates for those 3 positions must be willing to fill the specific duties. The main function of each designated-duty Member-At-Large position is to coordinate efforts on the national level in this general area. For some specific projects, such as getting out the 2016 vote, the Member-At-Large coordinator may create work groups under his/her leadership. Maintain news posting traffic feed level as agreed with the ExCom on all social media where DACH has accounts: Facebook, Twitter, etc.